So I decided that I would write out directions for them so that they’d how to do things the right way. Their bread usually rose, eventually, but sometimes, I have to admit, it was a rather slow process. Today when my son followed these directions, he had the most beautiful, lively dough. I don’t know why I didn’t do this a long time ago. 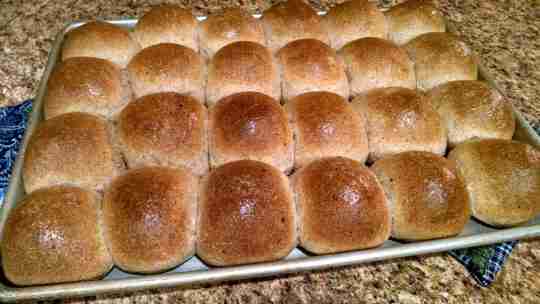 The following recipe is for delicious whole wheat dinner rolls. If you use a good quality whole wheat flour, you can use almost 100% whole wheat. Experiment with different amounts and see what works best for you. You’ll notice, too, that I’m using a Bosch Mixer, which I absolutely love. It takes most of the work out of making bread, but it is completely unnecessary. I mixed up bread for years by hand. Put six cups warm water in a large mixing bowl. This can be half milk. Add 2 Tablespoons yeast, 1 cup sugar, and 6 cups whole wheat flour. Mix well. This makes what’s called a sponge and is a good base to allow the yeast to grow a bit. It feeds on the sugar and flour. Melt 1 1/2 cup butter (or lard, coconut oil, or fat of your choice) in small saucepan. Allow to cool. Depending on the type of fat used and the temperature it may not need melting. Meanwhile, add 4 eggs. These can be cracked into a small bowl first if you’re not confident of your egg cracking skills. Add 2 Tablespoons salt, and an optional 1 cup ground flax seed. The flax seed looks good in the final product, gives the bread a great flavor, and is good for you, too. I grind my flax seed in the blender and store it in the freezer. Add the cooled melted butter. Beat well. Then add 8 more cups whole wheat and 2 cups white flour kneading well after each addition. If using a Bosch mixer, mix for 8-10 minutes. If doing it by hand, I would probably mix it for 8-10 minutes after I had all the flour in. A good long kneading is what makes beautiful buns. When we made this today I added a bit more whole wheat flour (about one extra cup) because the dough was a bit sticky. Looking back, this might not have been necessary since the dough could have been softer. Allow to rise until double. Beat down. Allow to rise again until about double. The dough here doesn’t look as smooth as it should, because I had the lid resting lightly on top of it and it tore up the dough a bit getting it off. Cut into uniform pieces and form into buns by rolling them under the palm of your hand while forming into a ball by applying pressure with your thumb and fingers. Place on greases cookie sheets. I love the little flax seed specks in the buns. Maybe next time I’ll add more ground flax seed. This technique takes a while to learn, but my boys can form pretty good buns by now. I got three cookie sheets full of buns. Allow to rise again until about double in size and you can see small air pockets forming under the surface of the dough. Here the buns are almost ready for the oven. Time to start pre-heating. Preheat oven to 400 degrees and bake for 14-16 minutes until lightly brown. Remove from oven and brush with butter. Is there anything better than hot buns fresh from the oven? If you flip the pan around after about 10 minutes, they’ll bake more evenly. I bake one pan at a time and this usually works out well, because the pans usually rise at different speeds. If they’re all rising at the same speed I’ll put some in a warmed-up oven to hurry them along. That’s it. Slather with butter and enjoy. Is there anything better than hot buns, fresh from the oven? Put warm water in large bowl. Add 1 cup sugar, 6 cups whole wheat flour, and two tablespoons yeast. Beat well and allow to rest. Melt butter (if not room temperature). Allow to cool. Add 4 eggs, 2 tablespoons salt, and 1 cup ground flax to warm water and flour mixture. Add cooled butter. Mix well. Add remaining 8 cups whole wheat flour and 2 cups white flour. Knead well. Add more flour if too sticky. Allow to rise until double. Punch down. Allow to rise again until double. Form into buns. Bake at 400 degrees for 14-16 minutes until lightly brown. Remove from oven. Brush with butter. Enjoy! When I made this, I got 7 dozen buns, but it will depend on how big you make the buns. I put 6 dozen in the recipe because when you halve the recipe the measurements come out more evenly. These are some of the best buns you’ve ever tasted, though I will admit my mom’s are better. Maybe it’s because she lets hers rise longer, and I always get impatient or scared they’ll fall on me. Or maybe Mom’s cooking just always tastes better. This might look like a big recipe, but they don’t last long around here. You could use this same recipe for bread if you made the dough slightly stiffer, but sometimes I use the same dough and just make half into bread and half into buns. And sometimes I even roll out a section, spread with butter, brown sugar, and cinnamon and make healthy cinnamon rolls. Mmm! If you try this recipe, I’d love to hear how it turned out. Happy baking! This post may be shared at one or more of these linkups. Beautiful! I love making bread! Thank you! I love baking bread, too, but I don’t get around to it as much as I’d like. You had me questioning myself a bit, so I looked it up and, yes, they both retard yeast growth if there is too much. I’ve really noticed this when I forget to add salt to bread. 🙂 I’m glad you enjoyed the post! How long do you allow your sponge to rest? I usually don’t let it rest very long, just as long as it takes me to get some other ingredients together, but I’m sure you could let it rest longer. Probably a few hours might be better. This looks like a great recipe and i can’t wait to try it. I’m a little intimidated by baking breads but you explained it real well. Thanks for the invitation! I’ll check it out.